So far it appears that the newly appointed prime minister and his ministers have no intention of surrendering their recently acquired power and privileges. They have sought to delegitimize parliament by accusing the Speaker Karu Jayasuriya of bias and the votes against them of being part of a flawed process. This is a potentially dangerous situation. It is unwise to be complacent and to believe that time and space is available to engage in conflict resolution or that matters will proceed in a linear direction. There is a possibility that there could be a new plunge to further crisis, emergency and further political polarization. So far President Maithripala Sirisena has not exercised his power to end the unprecedented deadlock in governance that is costing the country dearly. The economy has come to a standstill and will soon plunge downhill unless the government starts to function in a cohesive manner again. The officials in government departments are reluctant to take any new decisions as they are aware that the legitimacy of their present ministers is in question. Speaker Jayasuriya has announced that the prime minister and his ministers do not exist as a consequence of the votes of no-confidence against them in parliament. President Sirisena has two sources of power when it comes to ending the current deadlock. One is his power to dismiss the prime minister and his government. This is a power that the president exercised under controversial circumstances when he dismissed Prime Minister Wickremesinghe even when he was demonstrating that he enjoyed the majority support in parliament. If the president could sack Prime Minister Wickremesinghe there is no reason why he cannot do the same to Prime Minister Rajapaksa who has repeatedly failed to demonstrate majority support in parliament. The second source of power that the president possesses is coercive power as commander-in-chief of the armed forces and as minister of defense that includes the police. Institutions such as parliament and the judiciary can pass laws and make decisions. But they cannot directly implement the decisions they make. This is the task of the executive branch of government and is in accordance with the principle of separation of powers. The ultimate source of executive power lies with the president who appoints the prime minister, ministers and heads of the armed forces. President Sirisena has been extremely circumspect in his use of the coercive power of the state from the time he became president in 2015. By way of contrast the previous president and his government were seized with a national security mindset. This caused them to unleash the military even on communities who were publicly protesting their rights to drinkable water. It is to the credit of the President Sirisena that even as the country faces a protracted political crisis, with large public protests in the heart of the capital, he has ensured that raw military power will not be exercised. The ongoing political crisis commenced with President Sirisena’s decision to dismiss Prime Minister Wickremesinghe and to hand that post over to Prime Minister Rajapaksa. The crisis that started with the president needs to be ended also by the president. But the problem is that the president is repeatedly stating both in public and private that he cannot work together with Prime Minister Wickremesinghe and will therefore not appoint him again as prime minister. This is not a position that is either constitutional, just or in keeping with parliamentary tradition, in which the person who enjoys majority support in parliament is appointed as prime minister. On the other hand, the parliamentary majority has made it clear through written and verbal statements that their choice is indeed Prime Minister Wickremesinghe. As the relationship between the president and prime minister is necessarily an official one, and not a private one, it is not appropriate for the president to insist on his position that he cannot work with Prime Minister Wickremesinghe and will therefore not appoint him to that position. it may be possible to find a solution that is both constitutional and just and also minimizes the time he has towork together with the Prime Minister he says he cannot work together with. When there is deadlock and a mutually hurting stalemate where all sides are hurting, and the country and its people are hurting, it is important that political leaders should rise to the challenge. There is a need for a win-win solution that all competing groups can be part of. 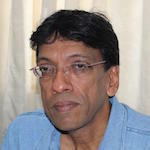 One proposal being made is for President Sirisena to correct the situation by reappointing Prime Minister Wickremesinghe on the one hand, and to get together with him and Prime Minister Rajapaksa to decide on holding a general election under peaceful conditions, and which the latter has been demanding. President Sirisena can still emerge a statesman and not as the politician who took the country in an uncharted direction that eroded its democracy and economy for a long time to come. Thank you Gehan Perera for keeping your iconic cool over the past few decades. We have drifted into a very messy domain. It is slippery but maybe there is a silver lining. Never ever get back into the domain of the recent ‘happenings’. Given the way things are, a coalition government is the ONLY way out. According to the last Para, there appears to be Two Prime Ministers Ranil and Mahinda’ Mahinda’s appointment is illegal and what is the necessity for Srisena to consult Mahinda about the elections. it appears that Srisena refuses to accept his mistakes. All what he has to do is to restore the status quo prior October 26 and allow the Parliament to function as usual. Let the parliament takes it own course and decide on the date for dissolution or no dissolution according the constitution. Giving prominence to Mahinda at this stage when he has created so much of problem (ofcourse along with Srisena) means that he has won the day to carry out his election propaganda.. This is a good lesson for Ranil too that he cannot go on cheating the voters by having kusu kusu kootam with Mahinda. May be A DATE SHOULD BE FIXED FOR PRESIDENTIAL ELECTION TOO AS EARLY AS POSSIBLE, AS THERE DOESN’T SEEM TO BE ANY CONSTITUTIONAL IMPEDIMENTS. Win – win solution ? There are no short cuts. The President had appointed a PM……. Did the opposition follow procedure to bring in a NCM? in parliament? Did the Speaker adhere to the procedure or the rule. There is a laid out process. Why was not it followed in a legitimate manner? In SL there are only winners and loosers. It cannot get more ridiculous than that. Johan, you must have been living in a different planet. This is not a way out or even a win-win situation. This is indeed a deal, however I do not think that the President will go for it, although a more patient man would re-instate Ranil and then go for general elections on January 20th or whatever date. Since the UPFA+Pohottuwa is expected to win, RW can enjoy his last one and a half months as PM. JP – you have not come up with a plausible or even feasible way out in your past para. Perhaps what could work is for the UNF to persuade My3 to restore RW to PM on the condition he then resigns immediately after in favour of an MP who can demonstrate a parliamentary majority, ie Sajith. It is time the UNF accepted that RW was always an unsuitable choice for PM and for Sajith to stop playing coy.